LeSean Kamel "Shady" McCoy (born July 12, 1988) is an American football running back for the Buffalo Bills of the National Football League (NFL). He was drafted by the Philadelphia Eagles in the second round of the 2009 NFL Draft. He played college football at Pittsburgh. McCoy attended Bishop McDevitt High School in Harrisburg, Pennsylvania, from 2002 to 2006. In his senior year of high school, McCoy suffered a major ankle injury, which threatened his career. In his first year at Pittsburgh in 2007, McCoy rushed for over 1,300 yards and recorded 14 touchdowns. In 2008, McCoy was selected as a second-team All-American. His 21 rushing touchdowns were third in the nation, only one behind the two leaders. McCoy made his NFL debut on September 13, 2009, against the Carolina Panthers. He rushed for 637 yards that year. In 2010, McCoy took over as the starting running back for the Eagles, and broke the 1,000 yard rushing barrier. In 2011, McCoy was named First team All-Pro by the Associated Press. In 2012, McCoy suffered a concussion that limited him to only twelve games. In 2013, McCoy led the NFL in rushing yards with 1,607, shattering the team's individual single-season rushing yards record that stood for 34 years. McCoy went on to become the all-time leading rusher for the Eagles after the 2014 season, breaking the record previously held by Wilbert Montgomery. In the 2015 offseason, he was traded to the Bills for linebacker Kiko Alonso. After the trade, he signed a new five-year contract worth $40 million. McCoy was born in Harrisburg, Pennsylvania. His nickname is "Shady" and was given to him by his mother because of his mood swings where he would one second be happy and laughing and the next second be upset and crying. He attended Bishop McDevitt High School in Harrisburg, the same high school attended by NFL running back Ricky Watters. He played high school football for the Crusaders while there. As a sophomore, he once rushed for 406 yards in a game. As a junior, he ran for 2,828 yards, scored 35 touchdowns, and earned Associated Press Class AAAA player of the year, Offensive MVP of the Mid-Penn Commonwealth Conference, 1st team Associated Press All-State. As a high school senior, he earned first team Class AAAA Associated Press All-State; During his senior season, McCoy had committed to Miami. However, academic issues and a broken ankle led McCoy to attend prep school at Milford Academy in New Berlin, New York for the 2006–07 school year. He had been invited to play in the Big 33 Football Classic and the U.S. Army All-American Bowl that year, but ultimately did not participate in those games as he was still recovering from his injury. Following a coaching change at Miami, McCoy committed to the University of Pittsburgh on February 16, 2007. At the 2004 State College NIKE Training Camp, McCoy recorded a 4.23 forty yard dash, the fastest forty time of the event. McCoy was "rated the nation's number 11 high school prospect" by recruiting analyst Tom Lemming. A 2006 ESPN evaluation described him as "lightning in a bottle every time he touches the ball." In 2012, McCoy's high school number (20) was retired at Bishop McDevitt. The only other McDevitt player whose number has been retired is Ricky Watters. McCoy entered Pittsburgh as a transfer from Milford Academy. He started the season as a backup to Larod Stephens-Howling who was the starting running back in 2006 and rushed for over 890 yards the previous season. In August 2007, Dave Grdnic wrote for Panthers Digest, "After just one week, LeSean McCoy has been as amazing as advertised. He's been dynamic on the field and off, banging up the middle on runs as hard as he bolts around end and talking just as good a game to the media. As a freshman, McCoy was the point-man for the "Wildcat offense" which the Pittsburgh Panthers unveiled in a September 2007 game against the Michigan State Spartans. In the Wildcat offense, McCoy lined up as quarterback in a shotgun formation and took direct snaps from center, A Sporting News article credited him for having one of the "best starts by a freshman running back at Pittsburgh since Tony Dorsett", while the Wildcat offense was criticized. "McCoy might need to be a combination of both Dorsett and Dan Marino for the Panthers to start producing some offense other than through his running." On October 2, 2007, ESPN writer Pat Forde featured McCoy under the "instant impact" section of his column. Forde had this to say, "Pittsburgh. When starting running back LaRod Stephens-Howling got hurt, McCoy stepped in and Wally Pipped him. McCoy has 503 rushing yards and six touchdowns, averaging six yards a carry." McCoy had a streak of four consecutive games, from October 10 to November 3, where he rushed for at least 120 yards. He rushed for a season-high 172 yards against Michigan State on September 15, just his third game at Pittsburgh. McCoy finished his freshman year ranked third in the Big East Conference and 25th in the NCAA Division I FBS (formerly I-A) in rushing yards with 1,328. McCoy was named to the Freshman All-American team by Rivals.com and was also a first team All-Big East selection by Rivals.com. In his final game of his freshman year, McCoy ran for 148 yards against rival West Virginia in the 100th Backyard Brawl to help the 28-point underdog Panthers defeat the then #2 Mountaineers. That win also knocked West Virginia from a probable spot in the BCS National Championship Game. McCoy entered his sophomore year as one of the top running backs in college football. In an article written by Paul Zeise of the Pittsburgh Post-Gazette in late July 2008, McCoy's coach Dave Wannstedt had this to say about McCoy's his approach in the off-season, "He's been very mature, he's taken the right approach," Wannstedt said. "I like to see a talented young guy who takes the initiative to want to be the best he can be and he clearly is doing his part." In mid August 2008, Pro Football Hall of Famer, Tony Dorsett told the Associated Press that "He (McCoy) reminded me of me. That looked a lot like No.33 (Dorsett). Pittsburgh started the 2008 season ranked inside the top 25 for the first time in five years. The Panthers faced Bowling Green at home to start the season, but fell to the Falcons 27-17. McCoy had one rushing touchdown and 71 rushing yards in a losing effort. This was McCoy's second lowest rushing total of the season. McCoy and the Panthers proceeded to win seven out of their next eight games. He had a streak of five games from September 27 to November 1 where he recorded over 140 rushing yards per game. During that five-game streak, he had 762 rushing yards and 10 rushing touchdowns. McCoy's best game was still ahead of him. After suffering a loss on the road to Cincinnati, a game in which McCoy led Pittsburgh in both rushing and receiving yards, Pittsburgh got a win at home against the West Virginia Mountaineers and McCoy rushed for 183 yards that day, setting a career-high which was previously 172, set during his freshman year. He also added two touchdowns that day, both coming in the fourth quarter. McCoy closed out the regular season with 95 rushing yards a touchdown in a winning effort 34-10 against the Connecticut Huskies. The Panthers were ranked #18 in the AP Poll following the win against the Huskies. McCoy's final college football game of his career was the 2008 Sun Bowl played on New Year's Eve in El Paso, Texas. He rushed for 85 yards, and the Panthers fell in a defensive battle to Oregon State by a score of 3-0. McCoy had said in November 2008 and in January 2009 that he was coming back to Pittsburgh for his junior year. On January 7, 2009, McCoy notified Wannstedt of his decision to go pro. However, he delayed the decision until January 14, when he officially announced he was leaving for the NFL. Talking to Larry Fitzgerald of the Arizona Cardinals, who also left after two years, helped sway McCoy. The team's performance in the Sun Bowl, did not have any influence though. On January 14, 2009, the University of Pittsburgh announced that McCoy declared himself eligible for the NFL Draft, forgoing his final two years of eligibility. The serious injury he sustained his senior year at Bishop McDevitt was a factor in his decision to enter the draft early. "As a result of a season-ending injury my senior year, I learned a humbling lesson," McCoy said. "Nothing is promised to us and it can all be taken away in a moment." All values from Pittsburgh Pro Day, except for Ht and Wt. McCoy was drafted by the Philadelphia Eagles in the second round (53rd overall) of the 2009 NFL Draft. He was the fourth running back to be selected that year. He signed a four-year contract for $3.47 million, including $1.72 million guaranteed, with the team on June 29, 2009. McCoy was pressed into service as a starter in Week 3 against the Kansas City Chiefs on September 27, 2009, when the Eagles deactivated starter Brian Westbrook due to an ankle injury. He scored his first touchdown in the first quarter of the game on a five-yard rush. McCoy started against the New York Giants on November 1, 2009. He carried the ball eleven times for 82 yards and a touchdown and caught two passes for ten yards. McCoy made his third start for a NBC Sunday Night Football game against the Dallas Cowboys. McCoy rushed 13 times for 54 yards and caught five passes for 61 yards in a 20–16 losing effort. Westbrook sustained a concussion against San Diego and McCoy was called on again to be the starter in a road game against the Chicago Bears on NBC Sunday Night Football. He rushed 20 times for 99 yards and a touchdown, as the Eagles won the game 24–20. On December 20, 2009, against the San Francisco 49ers, McCoy broke the all-time Eagles rookie rushing record with 606 yards on the year. The record was previously set by Correll Buckhalter with 586 yards in 2001. Also in December, the New York Daily News wrote about the top ten rookies in 2009. McCoy was listed fourth on the list and this was what writer Ralph Vacchiano had to say, "The fact that the Eagles are rolling without Brian Westbrook is, in part, a testament to how good this rookie is." Overall, in the 2009 season, he finished with 637 rushing yards, four rushing touchdowns, and 308 receiving yards. During McCoy's rookie season, he wore the number 29. On March 18, 2010, McCoy changed to number 25, which he had worn at the University of Pittsburgh. Number 25 was previously worn by Lorenzo Booker. Coach Reid had this to say in August, "... He wants it every carry. He’s been running very hard. He’s in great shape, and I think he is ready to roll." McCoy took over the starting running back duties in 2010 after previous starter Brian Westbrook was released in the off-season. McCoy carried the ball seven times for 35 yards in an early season loss against the Green Bay Packers. He followed this game up with a three-touchdown performance against the Detroit Lions the following week in a winning effort. Head coach Andy Reid had this to say about McCoy after his game against the Lions, "He added more strength in the off-season, really bought into the off-season program, worked his tail off and it's showing up now. He's going out and he's running more physical, he's more deliberate and accurate with his cuts, seeing the daylight and getting North and South, which you have to do in this league..." During a game against the San Francisco 49ers on October 10, McCoy broke a rib and continued to play through the injury, rushing for 92 yards and catching five passes for 47 yards, and helping lead his team to a victory. McCoy failed to break the 100-rushing yard barrier again until Sunday November 21 playing the New York Giants. Both the Eagles and Giants headed into this Sunday night contest at Lincoln Financial Field with a 6-3 win-loss record. McCoy ran for 111 yards and scored a touchdown, and caught 5 passes for 29 yards in the 27-17 win. After only receiving 22 carries in the next two games combined, McCoy ran for 149 yards on 16 carries, for an average of 9.3 yards per carry (YPC) against the Dallas Cowboys. Overall, in the 2010 season, McCoy finished with 1,080 rushing yards, seven rushing touchdowns, 592 receiving yards, and two receiving touchdowns. The Eagles finished the season 10-6 and won the NFC East Division. In the playoffs, the Eagles faced the Green Bay Packers at Lincoln Financial Field in a rematch of the season opener. They lost to the Green Bay Packers 21-16 after failing to score a touchdown in the first half. McCoy had 46 rushing yards in his second appearance in the NFL playoffs. ESPN Stats and Information did a special feature on ESPN where they handed out "Next Level Awards" to recognize outstanding play in the 2010 season. McCoy won an award in the "Locked and Loaded" category, which recognized the "best RB facing a loaded box". This is what was said about McCoy, "LeSean McCoy, literally, ran away with this award thanks to some hard-nosed running -- an aspect of his game that often is overlooked". ..."Fourteen running backs had at least 30 attempts against a loaded box this season. McCoy finished in the top four in rushing yards (207), touchdowns (three) and attempts per first down (2.8), despite having the fewest carries of those 14 backs (36)." The 2011 season started off with McCoy scoring four touchdowns and rushing for 345 yards in his first three games. In addition to that, he also caught nine passes and had one receiving touchdown, for a total of four. After only getting the ball 20 times on the ground in the next two games, and the Eagles dropping their fourth game in a row to the Buffalo Bills, starting the season off 1-4, the Eagles faced two divisional opponents. On the road at FedExField, against the Washington Redskins, McCoy rushed for 126 yards and a touchdown in a 20-13 win. Coming off a bye week, the Eagles faced the Dallas Cowboys on October 30, McCoy scored two touchdowns and rushed for 184 yards; the Eagles won 34-7. McCoy had a rough second half compared to the first. He rushed for over 100 yards twice in the next eight games. He failed to reach the 50-yard mark three times. McCoy saw inconsistency in the run game, some games getting the ball 15 or fewer times. McCoy missed the Eagles final game with a sprained ankle. When McCoy rushed for over 100 yards, the Eagles were 5-1. His 17 rushing touchdowns tied him for third all-time in rushing touchdowns in a single season by a running back aged 23 or younger. The only two running backs ahead of him are Hall of Famers Eric Dickerson and Emmitt Smith. McCoy finished the 2011 season as the league's fourth leading rusher, after sitting out the last game with an ankle injury. During the December 18, 2011 game against the New York Jets, McCoy broke the Eagles' single season touchdown and rushing touchdown records previously set by Steve Van Buren in 1945. As of December 2013, McCoy holds the records with 17 rushing and 20 total touchdowns. He was also voted into the Pro Bowl for his season's performance. McCoy won the FedEx Ground Player of the Year Award, and was also voted Associated Press All-Pro First Team running back. McCoy is one of only three running backs 23 years or younger to be named to the Associated Press All-Pro team since 1995. The other two are Edgerrin James(1999) and Adrian Peterson(2008). 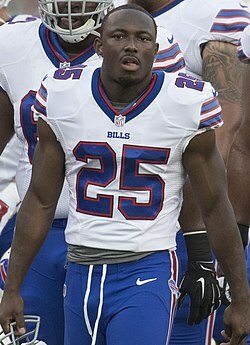 McCoy finished the 2011 season with 1,309 rushing yards, including six games of over 100 rushing yards. In 15 games played, he recorded a rushing touchdown in 12 of them, and scored a touchdown in 13 out 15. He finished first in the National Football League in rushing touchdowns, with 17, and lead the entire league in total touchdowns with 20. On May 17, 2012, it was announced that McCoy had signed a five-year contract extension with the Philadelphia Eagles. The contract is worth $45 million with $20.765 million guaranteed. On September 9, 2012, the Philadelphia Eagles traveled to Cleveland, Ohio to face the Cleveland Browns. McCoy rushed for 110 yards on 20 carries for an average of 5.5 yards per carry in the season opener. He out-rushed the whole Browns team 110-99 and the Eagles won 17-16. Coming back home to Philadelphia, McCoy scored his first touchdown of the young season, a one-yard run in the first quarter. The Eagles went on to defeat the Baltimore Ravens by a score of 24-23. In Week 4 against NFC East foe New York Giants, McCoy broke the 100-rushing yard barrier for the second time in four games with 123 yards on the ground. In the next five games, McCoy rushed for 321 yards for an average of 64.2 rushing yards per game. All five of those games were losses for the Eagles. On November 18, 2012, playing against the Washington Redskins, McCoy ran for 82 yards and had 20 receiving yards, but suffered a concussion in the fourth quarter of the game. He was injured with less than two minutes remaining in the game. McCoy did not return until December 23 in the second divisional game against the Washington Redskins. In his last two games he had 23 carries for 90 yards. He was used more in the passing offense though, catching 14 passes for a total of 138 receiving yards. He ended up missing four games on the year, playing in a total of 12. Overall, in the 2012 season, he finished with 840 rushing yards, two rushing touchdowns, 373 receiving yards, and three receiving touchdowns. 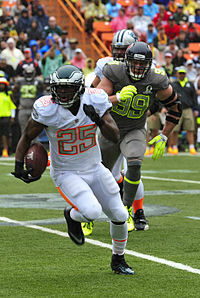 McCoy playing in the 2014 Pro Bowl. McCoy took the field for Monday Night Football on September 9, 2013, and rushed for 184 yards on 31 carries and scored a touchdown in a victory over the Washington Redskins. At the time, this was McCoy's second highest single game rushing total of his career.. His performance was good enough to earn him FedEx Ground Player of the Week honors. McCoy was only handed the ball 11 times in Week 2, resulting in 53 yards. However, he contributed as a wide receiver and caught five passes for 114 yards. 114 yards currently stands as McCoy's top receiving yards in a game. The Eagles then faced former head coach Andy Reid and the Kansas City Chiefs in Week 3, on Thursday Night Football. McCoy rushed for 158 yards on 20 attempts, for 7.9 yards per carry. Though the Eagles lost this game and fell to 1-2, McCoy surpassed 150 yards from scrimmage in each of his first three games of the season. Over the course of the next six games, McCoy saw somewhat limited action with varied results. He received more than 20 carries once in a game and broke 100 yards rushing only once. The Eagles dropped back to back games to divisional foes but defeated the Oakland Raiders on November 3, to bring their record to 4-5. McCoy rushed for 155 yards against the Green Bay Packers. This was his third game surpassing 150 yards rushing. On December 8, 2013, Philadelphia had their first major snowfall of the year, with over 8.5 inches of snow falling. With snow covering the entire field, and with it falling the entire first half, offense was hard to come by. The halftime score was 8-0 in favor of the Detroit Lions. Several minutes into the second half the Lions scored their second touchdown of the game, and subsequently took the lead 14-0. The second half was a breakout half for McCoy, who finished the game with 217 rushing yards on 29 carries. McCoy's 217 rushing broke a franchise record of 207 rushing yards that was previously held by Steve Van Buren. He also scored two touchdowns to help propel the Eagles to victory over the Lions 34-20. McCoy also earned for the second time in 2013, FedEx ground player of the week, in Week 14. In Week 15, the Eagles traveled to Minnesota. McCoy only had eight rushing attempts, as the Eagles elected to pass for much of the game. He did have 68 receiving yards, which put him over the 100 yards from scrimmage mark. The Eagles fell to the Vikings by a score of 48-30. As of Week 16, McCoy leads the NFL in rushing with 1,476 yards and is tied for first in rushing first downs. In Week 16 facing the Chicago Bears, McCoy rushed for 133 yards and scored two touchdowns. This moved him up to second on the Philadelphia Eagles single season rushing yards list. In Week 17 against the Dallas Cowboys, he broke Wilbert Montgomery's Eagles regular season rushing record (1,512 in 1979) and Brian Westbrook's record of most yards from scrimmage (2104 in 2007). McCoy rushed for 131 yards on 27 carries, finishing out the last drive of the game with 23 yards on 6 rushes. The Eagles won 24-22 and earned a playoff spot - the third seed in the NFC at 10-6. McCoy rushed for 77 yards and one touchdown in the Eagles' game against the 11-5 New Orleans Saints, but the team lost 26-24 after a last-second field goal. For the 2013 season, McCoy rushed for 1,607 yards and was also the all-purpose yards leader at 2,146. McCoy followed up his 2013 season by rushing for 1,319 yards, which finished third after DeMarco Murray and Le'Veon Bell for the league lead. However, he only totaled five touchdowns, all on the ground. This was in part due to the Eagles signing veteran Darren Sproles, who scored six rushing touchdowns, and Chris Polk being used more for goal-line situations, resulting in four rushing touchdowns for him. His most impressive game was in Week 13 in the 33–10 blowout against the Eagles' divisional rival, the Dallas Cowboys, where he ran for 159 yards and a touchdown. McCoy's most notable accomplishment was becoming the Eagles' all-time leading rusher, finishing with 6,792 yards. Wilbert Montgomery, the previous record holder (as well as second and third place Brian Westbrook and Steve Van Buren), had taken eight seasons to compile the yards he had, while McCoy only took six. On March 10, 2015, the Eagles traded McCoy to the Buffalo Bills in exchange for the linebacker Kiko Alonso. He then signed a new five-year contract worth $40 million. McCoy's offseason was filled with many comments on his former coach, such as how Eagles coach and general manager Chip Kelly "got rid of all the good black players" or that he "doesn't like or respect stars". McCoy's season started slow, although this could be attributed to a nagging hamstring injury. Although McCoy rushed for 89 yards on 15 carries against the New England Patriots in Week 2, he had a yards per carry average less than 2.5 in games against the Indianapolis Colts and Miami Dolphins (although he did grab a receiving touchdown against the Dolphins). After missing two games with a hamstring injury, McCoy returned to his elite form, rushing for 90 yards on 17 carries against the Cincinnati Bengals, gaining his first rushing touchdown of the season. This game started a streak where McCoy gained over 100 yards from scrimmage for seven consecutive weeks, which was ended with a season ending MCL sprain against the Washington Redskins, his longtime divisional rival while he was with the Eagles. In December, as the Bills prepared to face the Eagles in Philadelphia, McCoy said he would not shake Chip Kelly's hand, his former coach and the man who traded him. Although he kissed the Eagles logo on Lincoln Financial Field and hugged owner Jeffrey Lurie, he did not participate in postgame ceremonies when the Bills lost. He was ranked 69th on the NFL Top 100 Players of 2016. On September 11, 2016, in the season opener, McCoy ran for 58 yards on 16 carries and scored one touchdown as the Bills lost to the Baltimore Ravens by a score of 13–7. On September 25, he carried the ball 17 times for 110 rushing yards and two rushing touchdowns against the Arizona Cardinals. During a Week 5 victory over the Los Angeles Rams, he carried the ball 18 times for 150 yards, marking the most he had in a single game since joining the Bills. 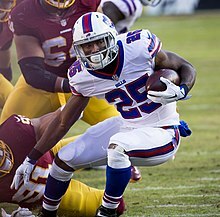 On October 16, 2016, McCoy had 19 carries for 140 rushing yards and tied his single game career-high of three rushing touchdowns as the Bills defeated the San Francisco 49ers and McCoy's former head coach Chip Kelly by a score of 45–16. McCoy was named to his fifth career Pro Bowl on December 20, 2016. He finished the 2016 season with 1,267 rushing yards on 234 carries and scored 13 rushing touchdowns. He was ranked 27th by his peers on the NFL Top 100 Players of 2017. Along with quarterback Tyrod Taylor and backup running back Mike Gillislee, McCoy helped Buffalo lead the NFL in rushing yards for the second consecutive year. On September 10, 2017, McCoy had 159 yards (110 rushing and 49 receiving) from scrimmage in a 21–12 season opening win against the New York Jets. In this game, McCoy eclipsed 12,000 scrimmage yards for his career. He became the sixth active player to reach the mark and one of 60 players to ever reach 12,000 yards from scrimmage. Despite struggling early in the season in Rick Dennison's offense, McCoy had strong games against the Tampa Bay Buccaneers, Oakland Raiders, and the Los Angeles Chargers. During Week 14 against the Indianapolis Colts in blizzard-like conditions, McCoy rushed for 156 yards and the game-winning touchdown in overtime, allowing the Bills to win 13–7. The performance against the Colts put McCoy over 1,000 rushing yards for the season. On December 17, 2017 in a game against the Miami Dolphins he became the 30th NFL player to exceed 10,000 rushing yards. On the play that took him over the 10,000 yard mark he was tackled by Kiko Alonso, who was the player in the 1-for-1 trade that brought McCoy to the Bills. On December 19, 2017, McCoy was named to his sixth Pro Bowl. The Bills finished the regular season with a 9–7 record and made the playoffs as the #6-seed. In the Wild Card Round against the Jacksonville Jaguars, he finished with 75 rushing yards and 44 receiving yards as the Bills lost by a score of 10–3. Despite a chaotic offseason, the Bills named McCoy a team captain for the 2018 season. Early in the season, McCoy struggled along with the team partly due to an overall inexperienced offensive unit and injuries. In the first nine games, McCoy totaled 85 carries for 267 rushing yards and 23 receptions for 186 receiving yards as the Bills went 2–7. In Week 10, against the New York Jets, McCoy had his best performance of the season with 113 rushing yards and two rushing touchdowns in the 41–10 victory. McCoy finished the season with just 514 rushing yards, three touchdowns, and 3.2 yards per carry, all career lows. However, following the season's conclusion, Bills general manager Brandon Beane remained confident in McCoy, announcing intentions to keep him on the team through the end of his contract. McCoy's brother, LeRon McCoy, is a former wide receiver who played for the Arizona Cardinals. McCoy has one son, LeSean Jr. In August 2012, McCoy became a partner and investor in premium sports drink BodyArmor SuperDrink. On November 28, 2012, McCoy was featured in an episode of E:60 titled "The Real McCoy". The interview was done by ESPN reporter Lisa Salters. It details the story of McCoy's high school career and his ankle injury. In May 2013, McCoy was sued for his alleged actions towards a woman using the alias "Mary Roe" aboard a party bus on the New Jersey Turnpike. Roe testified that McCoy humiliated her and 15 other women by spraying them with a beverage before ejecting Roe from the vehicle. McCoy’s attorney Andrew Smith Esq. responded, "There are no criminal charges pending and no probable cause was ever found," stating that the accuser was simply attempting to collect money from McCoy. Roe sued for over $50,000 in damages for assault and battery, intentional infliction of emotional distress, false imprisonment and negligence. In September 2014, McCoy received criticism for leaving a $0.20 tip at the PYT burger restaurant in Philadelphia. McCoy claimed the low tip was due to "bad service." The owner responded on September 9, 2014, saying that McCoy had been "verbally abusive" and made "derogatory comments about women." McCoy has been a resident of the Marlton section of Evesham Township, New Jersey. McCoy opined that Colin Kaepernick, known for starting the 2016 U.S. national anthem protests, "was not worth the distraction" when asked why the latter was not on an NFL roster as of 2017. However, in light of President Donald Trump's comments that NFL players who kneel during the anthem "should be fired", McCoy took part in the protests, even continuing to stretch during the anthem before a September 24 game against the Denver Broncos. McCoy defended the participation of his teammates and himself in the protests, saying that while the national anthem and flag "meant a lot" to himself and his teammates, he could not "stand and support something when the leader of this country is acting like a jerk." The Bills as a whole had met together before the game to discuss how they would respond to President Trump's statement. On July 10, 2018, a post on Instagram alleged that McCoy battered a woman, along with accusations that McCoy beat his son, his pet dog, and that he also used illegal steroids. The post was soon deleted and McCoy denied all of the allegations made in a statement stating he had "not had any direct contact with any of the people involved in months." In response, the Buffalo Bills issued a statement via Twitter stating, "We have spoken to LeSean McCoy and have been in contact with the National Football League. We will continue to gather information." The woman in question was McCoy's former girlfriend Delicia Cordon, with whom he had a tumultuous relationship according to police records. Court documents show that McCoy had been trying to evict Cordon from a house he owned in Milton, Georgia for some time and was concerned that Cordon would falsely accuse him of domestic violence. Cordon was robbed and assaulted at the home by a masked assailant on July 10, which coincidentally was the same day as a previously postponed court date for the eviction hearing. The assailant stole jewelry that Cordon claimed McCoy gifted her. ^ a b "LeSean McCoy Game By Game Stats and Performance - Pittsburgh - ESPN". Espn.go.com. July 12, 1988. Retrieved December 24, 2013. ^ "Rivals.com College Football - Rivals.com 2008 All-America Teams". Collegefootball.rivals.com. Archived from the original on December 16, 2008. Retrieved December 24, 2013. ^ "Philadelphia Eagles vs. Carolina Panthers - Box Score - September 13, 2009 - ESPN". Espn.go.com. September 13, 2009. Retrieved December 24, 2013. ^ "LeSean McCoy Game By Game Stats and Performance - Philadelphia Eagles - ESPN". Espn.go.com. July 12, 1988. Retrieved December 24, 2013. ^ "Philadelphia Eagles 2010 Statistics - Team and Player Stats - ESPN". Espn.go.com. January 1, 2013. Retrieved December 24, 2013. ^ "The 2011 Associated Press All-Pro Team roster". Content.usatoday.com. January 6, 2012. Retrieved December 24, 2013. ^ a b "LeSean McCoy of Philadelphia Eagles leaves loss with concussion - ESPN". Espn.go.com. November 19, 2012. Retrieved December 24, 2013. ^ "2013 NFL Player Rushing Stats - National Football League - ESPN". Espn.go.com. Retrieved December 24, 2013. ^ a b "Eagles Acquire LB Alonso For RB McCoy". PhiladelphiaEagles.com. March 10, 2015. ^ a b Pelissero, Tom. "LeSean McCoy, Bills agree to new five-year contract". USA Today. Retrieved March 10, 2015. ^ "LeSean McCoy on playing in Buffalo now: 'The fans are like family'". Rochester Democrat and Chronicle. Retrieved December 4, 2018. ^ Greenstein, Teddy (November 2, 2008). "Pitt's 'Shady' McCoy shines in South Bend spotlight - Chicago Tribune". Articles.chicagotribune.com. Retrieved December 24, 2013. ^ "Scout.com: LeSean McCoy Profile". Recruiting.scout.com. Retrieved December 24, 2013. ^ "Bills running back LeSean McCoy returns to 'where his roots are' for Sunday's game at the Eagles". PennLive.com. Retrieved December 4, 2018. ^ "How LeSean McCoy became Shady?". Nfl.com. May 18, 2012. Retrieved December 24, 2013. ^ "LeSean McCoy Profile". Scout.com. Retrieved September 23, 2007. ^ "LeSean McCoy Unfiltered – Miami Hurricanes – Sun-Sentinel". Blogs.sun-sentinel.com. May 3, 2006. Retrieved December 24, 2013. ^ Keith Srakocic/AP (December 29, 2008). "Pittsburgh's LeSean McCoy turns grisly | OregonLive.com". Blog.oregonlive.com. Retrieved December 24, 2013. ^ "LeSean McCoy Recruiting". ESPN.com. ESPN. Retrieved August 9, 2011. ^ "LeSean McCoy: State College NIKE Training Camp". State College, Pennsylvania: Rivals.com. May 15, 2004. Retrieved May 15, 2004. ^ "LeSean McCoy Profile". PittsburghPanthers.com. CSTV. Retrieved September 18, 2007. ^ "LeSean McCoy". ESPN. 2006. Retrieved September 23, 2007. ^ Central PA (October 20, 2012). "LeSean McCoy gets his number retired at Bishop McDevitt". PennLive.com. Retrieved December 24, 2013. ^ "LeSean McCoy, Milford Academy , Running Back". 247Sports. Retrieved December 4, 2018. ^ Grdnic, Dale. "McCoy Can't Wait For Season To Begin". Retrieved December 23, 2013. ^ Grdnic, Dale. "McCoy Dazzling Pitt's Defense". Retrieved December 23, 2013. ^ Zeise, Paul (September 16, 2007). "Mistake-plagued Pitt falls, 17–13, McCoy's running, defense keep it close". Pittsburgh Post-Gazette. Retrieved September 23, 2007. ^ "McCoy's weakness: He can't be a QB and RB at the same time". Sporting News. Pittsburgh. Associated Press. September 21, 2007. Retrieved December 30, 2012. ^ "Pittsburgh Panthers vs. Michigan State Spartans - Recap - September 15, 2007 - ESPN". Espn.go.com. September 15, 2007. Retrieved December 24, 2013. ^ "2007 Rushing Stats | College Football at". Sports-reference.com. Retrieved December 24, 2013. ^ "2007 NCAA Division I-A College Football Individual Statistics Leaders for Rushing - ESPN". Espn.go.com. Retrieved December 24, 2013. ^ "Rivals.com College Football - Crabtree leads scary list of young talent". Collegefootball.rivals.com. Retrieved December 24, 2013. ^ Fox, David (November 28, 2007). "2007 Rivals.com All Big East Team". Rivals.com. ^ Finder, Chuck (December 2, 2007). "Unranked Panthers win 100th Backyard Brawl, 13–9". Pittsburgh Post-Gazette. Morgantown, West Virginia. ^ "A decade later, Pitt players still revel in WVU's pain after '13-9'". Pittsburgh Post-Gazette. Retrieved December 4, 2018. ^ Mihoces, Gary (July 21, 2008). "Pittsburgh's McCoy is one runner to watch out for this fall - USATODAY.com". Usatoday30.usatoday.com. Retrieved December 24, 2013. ^ Zeise, Paul (July 31, 2008). "McCoy hungry for more success - Pittsburgh Post-Gazette". Post-gazette.com. Retrieved December 24, 2013. ^ AP Photo/University of Pittsburgh, Will Babin (August 12, 2008). "Tony Dorsett caught under Shady spell | PennLive.com". Blog.pennlive.com. Retrieved December 24, 2013. ^ "Bowling Green State at Pittsburgh Box Score, August 30, 2008". College Football at Sports-Reference.com. Retrieved February 1, 2018. ^ "LeSean McCoy 2008 Game Log". College Football at Sports-Reference.com. Retrieved February 1, 2018. ^ "LeSean McCoy Game By Game Stats and Performance - Pittsburgh - ESPN". Espn.go.com. July 12, 1988. Retrieved December 24, 2013. ^ a b "Pittsburgh Panthers vs. Cincinnati Bearcats - Box Score - November 22, 2008 - ESPN". Espn.go.com. November 22, 2008. Retrieved December 24, 2013. ^ "Pittsburgh Panthers vs. Connecticut Huskies - Box Score - December 06, 2008 - ESPN". Espn.go.com. December 6, 2008. Retrieved December 24, 2013. ^ "2008 NCAA College Football Polls and Rankings for Week 16 - ESPN". Espn.go.com. Retrieved December 24, 2013. ^ a b "Pittsburgh Panthers' LeSean McCoy to enter NFL draft - ESPN". Sports.espn.go.com. January 14, 2009. Retrieved December 24, 2013. ^ "2009 NFL Draft Underclassmen". WalterFootball.com. July 18, 2007. Retrieved December 24, 2013. ^ "LeSean McCoy Stats - Pittsburgh - ESPN". Espn.go.com. Retrieved December 24, 2013. ^ "Lesean McCoy Stats |". Sports-reference.com. Retrieved December 24, 2013. ^ "LeSean McCoy - College Football". Collegefootball.rivals.com. Retrieved December 31, 2013. ^ "LeSean McCoy". NFLDraftScout.com. Retrieved November 22, 2010. ^ LeSean McCoy (December 7, 1988). "National Football League: NFL Draft 2011 - LeSean McCoy". Nfl.com. Retrieved December 31, 2013. ^ "2009 NFL Draft Listing". Pro-Football-Reference.com. Retrieved February 1, 2018. ^ "LeSean McCoy Gets $1.72 Million Guaranteed | ProFootballTalk". Profootballtalk.nbcsports.com. Retrieved December 24, 2013. ^ DAVID WEINBERG; Staff Writer (November 9, 2009). "Westbrook deactivated for second game in row - Sports". Press of Atlantic City. Retrieved December 24, 2013. ^ "Kansas City Chiefs at Philadelphia Eagles - September 27th, 2009". Pro-Football-Reference.com. Retrieved February 1, 2018. ^ "New York Giants vs. Philadelphia Eagles - Recap - November 01, 2009 - ESPN". Espn.go.com. November 1, 2009. Retrieved December 24, 2013. ^ "Kansas City Chiefs vs. Philadelphia Eagles - Play By Play - September 27, 2009 - ESPN". Espn.go.com. September 27, 2009. Retrieved December 24, 2013. ^ "Dallas Cowboys vs. Philadelphia Eagles - Recap - November 08, 2009 - ESPN". Espn.go.com. November 8, 2009. Retrieved December 24, 2013. ^ "Eagles' Brian Westbrook suffers new concussion in first game back from head injury". Content.usatoday.com. November 15, 2009. Retrieved December 24, 2013. ^ "Philadelphia Eagles vs. Chicago Bears - Recap - November 22, 2009 - ESPN". Espn.go.com. November 22, 2009. Retrieved December 24, 2013. ^ "49ers vs. Eagles - Recap - December 20, 2009 - NFL - Football - SI.com". Sportsillustrated.cnn.com. Retrieved December 24, 2013. ^ "NYDN's 'NFLxTEN': Top Rookies of 2009". NY Daily News. December 23, 2009. Retrieved December 24, 2013. ^ "LeSean McCoy 2009 Game Log". Pro-Football-Reference.com. Retrieved February 1, 2018. ^ Ap Photo (March 18, 2010). "Philadelphia Eagles fans won't be able to tell the players without a program". lehighvalleylive.com. Retrieved December 24, 2013. ^ "McCoy, Others Get New Jersey Numbers | Blog | BlitzNation". Blog.blitznation.com. March 19, 2010. Retrieved December 24, 2013. ^ AP Photo/Rich Schultz, file. "Philadelphia Eagles training camp notes: LeSean McCoy continues to impress | PennLive.com". Blog.pennlive.com. Retrieved December 24, 2013. ^ "Philadelphia Eagles release Brian Westbrook - ESPN". Sports.espn.go.com. February 23, 2010. Retrieved December 24, 2013. ^ "Green Bay Packers vs. Philadelphia Eagles - Box Score - September 12, 2010 - ESPN". Espn.go.com. September 12, 2010. Retrieved December 24, 2013. ^ Ap Photo. "LeSean McCoy stronger and displaying improved vision, according to Andy Reid". lehighvalleylive.com. Retrieved December 24, 2013. 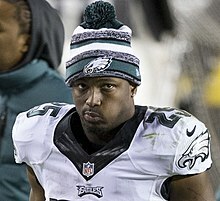 ^ "Mcall.com: Eagles Insiders : LeSean McCoy could be legend in the making". Blogs.mcall.com. Retrieved December 24, 2013. ^ "New York Giants vs. Philadelphia Eagles - Box Score - November 21, 2010 - ESPN". Espn.go.com. November 21, 2010. Retrieved December 24, 2013. ^ "Philadelphia Eagles vs. Dallas Cowboys - Recap - December 12, 2010 - ESPN". Espn.go.com. December 12, 2010. Retrieved December 24, 2013. ^ "LeSean McCoy 2010 Game Log". Pro-Football-Reference.com. Retrieved February 1, 2018. ^ "2010 NFL Regular Season Divisional Standings - National Football League - ESPN". Espn.go.com. Retrieved December 24, 2013. ^ "Green Bay Packers vs. Philadelphia Eagles - Box Score - January 09, 2011 - ESPN". Espn.go.com. January 9, 2011. Retrieved December 24, 2013. ^ a b "2010 Next-Level Awards: WR, RB, Defense - Stats & Info Blog - ESPN". Espn.go.com. Retrieved December 24, 2013. ^ "LeSean McCoy Game By Game Stats and Performance - Philadelphia Eagles - ESPN". Espn.go.com. July 12, 1988. Retrieved December 31, 2013. ^ "2011 Philadelphia Eagles Statistics & Players". Pro-Football-Reference.com. Retrieved February 1, 2018. ^ "Dallas Cowboys at Philadelphia Eagles - October 30th, 2011". Pro-Football-Reference.com. October 30, 2011. Retrieved December 24, 2013. ^ Graziano, Dan. "LeSean McCoy's season is over - NFL Nation Blog - ESPN". Espn.go.com. Retrieved December 31, 2013. ^ "LeSean McCoy 2011 Game Log". Pro-Football-Reference.com. Retrieved December 24, 2013. ^ "Rushing Touchdowns Leaders from 1920 to 2013". Pro-Football-Reference.com. ^ "2011 NFL Player Rushing Stats - National Football League - ESPN". Espn.go.com. Retrieved December 24, 2013. ^ Express-Times Photo (January 1, 2012). "Philadelphia Eagles' LeSean McCoy will sit out final game today against Washington Redskins". lehighvalleylive.com. Retrieved December 24, 2013. ^ "FedEx Players Air and Ground". NFL.com. Retrieved December 24, 2013. ^ "2011 NFL All-Pros". Pro-Football-Reference.com. Retrieved December 24, 2013. ^ "Players under 23 years old named All-Pro since 1995". Pro-Football-Reference.com. ^ "2011 NFL Player Scoring Stats - National Football League - ESPN". Espn.go.com. Retrieved December 24, 2013. ^ "LeSean McCoy 2011 Game Log". Pro-Football-Reference.com. Retrieved February 1, 2018. ^ "2011 NFL Rushing & Receiving". Pro-Football-Reference.com. Retrieved February 1, 2018. ^ "LeSean McCoy signs five-year extension with Eagles". NFL.com. Retrieved May 17, 2012. ^ "Philadelphia Eagles vs. Cleveland Browns - Box Score - September 09, 2012 - ESPN". Espn.go.com. September 9, 2012. Retrieved December 24, 2013. ^ "Baltimore Ravens vs. Philadelphia Eagles - Box Score - September 16, 2012 - ESPN". Espn.go.com. September 16, 2012. Retrieved December 24, 2013. ^ "New York Giants vs. Philadelphia Eagles - Box Score - September 30, 2012 - ESPN". Espn.go.com. September 30, 2012. Retrieved December 24, 2013. ^ "LeSean McCoy 2012 Game Log". Pro-Football-Reference.com. Retrieved December 24, 2013. ^ "LeSean McCoy 2012 Game Log". Pro-Football-Reference.com. Retrieved February 1, 2018. ^ a b "Philadelphia Eagles vs. Washington Redskins - Box Score - September 09, 2013 - ESPN". Espn.go.com. September 9, 2013. Retrieved December 24, 2013. ^ "Philadelphia Eagles single game rushing yard leaders". Pro-Football-Reference.com. ^ a b "LeSean McCoy Career Game Log". Pro-Football-Reference.com. July 12, 1988. Retrieved December 24, 2013. ^ "Kansas City Chiefs vs. Philadelphia Eagles - Box Score - September 19, 2013 - ESPN". Espn.go.com. September 19, 2013. Retrieved December 24, 2013. ^ "Philadelphia Eagles vs. Oakland Raiders - Box Score - November 03, 2013 - ESPN". Espn.go.com. November 3, 2013. Retrieved December 24, 2013. ^ "Philadelphia Eagles vs. Green Bay Packers - Box Score - November 10, 2013 - ESPN". Espn.go.com. November 10, 2013. Retrieved December 24, 2013. ^ "Winter Storm Dion: Snow and Ice Totals by State | Weather Underground". Wunderground.com. Retrieved December 24, 2013. ^ Didinger, Ray. "Didinger: Memories Of Steve Van Buren". Philadelphiaeagles.com. Retrieved December 24, 2013. ^ "Detroit Lions vs. Philadelphia Eagles - Box Score - December 08, 2013 - ESPN". Espn.go.com. December 8, 2013. Retrieved December 24, 2013. ^ "Philadelphia Eagles vs. Minnesota Vikings - Box Score - December 15, 2013 - ESPN". Espn.go.com. December 15, 2013. Retrieved December 24, 2013. ^ "Chicago Bears vs. Philadelphia Eagles - Box Score - December 22, 2013 - ESPN". Espn.go.com. January 1, 2013. Retrieved December 24, 2013. ^ "LeSean McCoy breaks Wilbert Montgomery's record for rushing yards in a season with Eagles". NJ.com. Retrieved December 31, 2013. ^ "Wild Card - New Orleans Saints at Philadelphia Eagles - January 4th, 2014". Pro-Football-Reference.com. Retrieved February 1, 2018. ^ "Eagles RB LeSean McCoy wins the NFL rushing, all-purpose and yards from scrimmage titles". Bleeding Green Nation. December 18, 2013. Retrieved December 31, 2013. ^ Spadaro, Dave. "McCoy Wins Rushing Title, Sets Record". Philadelphiaeagles.com. Retrieved December 31, 2013. ^ "2013 NFL Rushing & Receiving". Pro-Football-Reference.com. Retrieved February 1, 2018. ^ "2014 NFL Rushing & Receiving". Pro-Football-Reference.com. Retrieved February 1, 2018. ^ "LeSean McCoy 2014 Game Log". Pro-Football-Reference.com. Retrieved February 1, 2018. ^ "2014 Philadelphia Eagles Statistics & Players". Pro-Football-Reference.com. Retrieved February 1, 2018. ^ "Philadelphia Eagles at Dallas Cowboys - November 27th, 2014". Pro-Football-Reference.com. Retrieved February 1, 2018. ^ "Philadelphia Eagles Career Rushing Leaders". Pro-Football-Reference.com. Retrieved February 1, 2018. ^ "Indianapolis Colts at Buffalo Bills - September 13th, 2015". Pro-Football-Reference.com. Retrieved February 1, 2018. ^ "New England Patriots at Buffalo Bills - September 20th, 2015". Pro-Football-Reference.com. Retrieved February 1, 2018. ^ "Buffalo Bills at Miami Dolphins - September 27th, 2015". Pro-Football-Reference.com. Retrieved February 1, 2018. ^ "Cincinnati Bengals at Buffalo Bills - October 18th, 2015". Pro-Football-Reference.com. Retrieved February 1, 2018. ^ "LeSean McCoy 2015 Game Log". Pro-Football-Reference.com. Retrieved February 1, 2018. ^ "Buffalo Bills at Baltimore Ravens - September 11th, 2016". Pro-Football-Reference.com. Retrieved February 1, 2018. ^ "Arizona Cardinals at Buffalo Bills - September 25th, 2016". Pro-Football-Reference.com. Retrieved February 1, 2018. ^ "Buffalo Bills at Los Angeles Rams - October 9th, 2016". Pro-Football-Reference.com. Retrieved February 1, 2018. ^ "San Francisco 49ers at Buffalo Bills - October 16th, 2016". Pro-Football-Reference.com. Retrieved February 1, 2018. ^ NFL.com. "NFL Player Profile:LeSean McCoy". Retrieved October 17, 2016. ^ "NFL announces 2017 Pro Bowl rosters". NFL.com. December 20, 2016. ^ "LeSean McCoy 2016 Game Log". Pro-Football-Reference.com. Retrieved February 1, 2018. ^ "2016 NFL Standings & Team Stats". Pro Football Reference. Retrieved October 19, 2018. ^ Brown, Chris (September 10, 2017). "Ground game and run 'D' carry Bills to Week 1 win". Buffalo Bills. Retrieved September 12, 2017. ^ "NFL Yards From Scrimmage Career Leaders". Pro-Football-Reference.com. Retrieved September 12, 2017. ^ "Tampa Bay Buccaneers at Buffalo Bills - October 22nd, 2017". Pro-Football-Reference.com. Retrieved February 1, 2018. ^ "Oakland Raiders at Buffalo Bills - October 29th, 2017". Pro-Football-Reference.com. Retrieved February 1, 2018. ^ "Buffalo Bills at Los Angeles Chargers - November 19th, 2017". Pro-Football-Reference.com. Retrieved February 1, 2018. ^ Rodak, Mike (December 10, 2017). "LeSean McCoy all the Bills need to survive instant classic in snow". ESPN.com. ^ "McCoy scores to seal Bills' 13-7 OT win over Colts". USA TODAY. Retrieved December 4, 2018. ^ "Bills' McCoy passes 10K career rushing yards". ESPN.com. December 17, 2017. Retrieved December 4, 2018. ^ "The Latest: LeSean McCoy tops 10,000 yards rushing". ABC News. December 17, 2017. Retrieved December 17, 2017. ^ "NFL announces 2018 Pro Bowl rosters". NFL.com. December 19, 2017. Retrieved December 23, 2017. ^ "2017 Buffalo Bills Statistics & Players". Pro-Football-Reference.com. Retrieved February 1, 2018. ^ "Wild Card - Buffalo Bills at Jacksonville Jaguars - January 7th, 2018". Pro-Football-Reference.com. Retrieved February 1, 2018. ^ "Bills' LeSean McCoy: Provides 119 total yards in playoff loss". CBSSports.com. Retrieved December 4, 2018. ^ Filipowski, Nick (September 4, 2018). "Bills name Williams, Alexander & McCoy as captains". WIVB-TV. Retrieved October 9, 2018. ^ Ludwiczak, Mark (October 25, 2018). "Struggling Bills offense faces daunting challenge". AP NEWS. Retrieved December 4, 2018. ^ "LeSean McCoy 2018 Game Log (Weeks 1–8)". Pro-Football-Reference.com. Retrieved December 4, 2018. ^ Harner, Jenna (November 12, 2018). "Bills Offense Makes Statement, Run Game Gets Going In Blowout Over Jets". WIVB. Retrieved December 4, 2018. ^ Bergman, Jeremy (December 31, 2018). "Bills GM: LeSean McCoy will remain with team in 2019". NFL.com. ^ Martin, Kimberley A. (September 4, 2017). "Shady Speaks: LeSean McCoy on embracing Buffalo, making an impact, and the playoffs". The Buffalo News. Retrieved December 4, 2018. ^ Fishman, Jon M. (August 1, 2015). LeSean McCoy. Lerner Publications. ISBN 9781467789448. ^ "BODYARMOR SuperDrink™ Forms Superteam: Jason Pierre-Paul and LeSean McCoy Join as Partners and Investors - Newsroom - Market Wired". Marketwired.com. August 21, 2012. Retrieved November 22, 2013. ^ "E:60: The Real McCoy". YouTube. November 28, 2012. Retrieved December 24, 2013. ^ "LeSean McCoy Sued -- NFL Star Accused of Party Bus Assault." http://www.tmz.com. Ed. TMZ Staff. TMZ, May 14, 2013. Web. March 1, 2015. ^ "McCoy's Camp Refutes Allegations in TMZ Report." Ed. CSNPhilly Staff. CSN Philly, May 14, 2013. Web. March 1, 2015. ^ "LeSean McCoy discloses reasons behind $0.20 tip at Philadelphia burger joint". PennLive.com. Retrieved 2019-02-23. ^ Eichel, Molly. "PYT owner responds to LeSean McCoy 20 cent tip". philly.com. The Philadelphia Inquirer. Retrieved September 11, 2014. ^ Issa, Rob. "The Real McCoy", South Jersey Magazine, September 2014. Accessed August 12, 2015. "Eagles running back and Marlton resident LeSean McCoy is a star in the NFL, but he does some of his best work off the field." ^ Rodak, Mike (August 24, 2017). "Bills' LeSean McCoy says Colin Kaepernick's play not worth 'distraction' he comes with". espn.com. ESPN. Retrieved August 24, 2017. ^ Linder, Brian (September 24, 2017). "LeSean McCoy says Donald Trump should 'be a president,' 'be respectful'". PennLive. ^ Alpher, Joseph (September 24, 2017). "LeSean McCoy: It bothered me President objected to peaceful protest - ProFootballTalk". NBC Sports. ^ Rodak, Mike. "McCoy denies allegations; police investigating". ESPN.com. Retrieved July 11, 2018. ^ Hall, Ellie. "NFL Player LeSean McCoy Accused Of Domestic Violence In Graphic Instagram Post". BuzzFeed. Retrieved July 11, 2018. ^ Rodak, Mike (July 12, 2018). "LeSean McCoy's ex-girlfriend told police she believed home invasion was possible setup". ESPN. ^ a b Talbot, Ryan (July 12, 2018). "Police called to LeSean McCoy's home three times since July 2017". NYUpstate.com. ^ Petchenik, Mike (July 12, 2018). "Channel 2 obtains new details in bizarre LeSean McCoy investigation". WSB-TV. Wikimedia Commons has media related to LeSean McCoy.